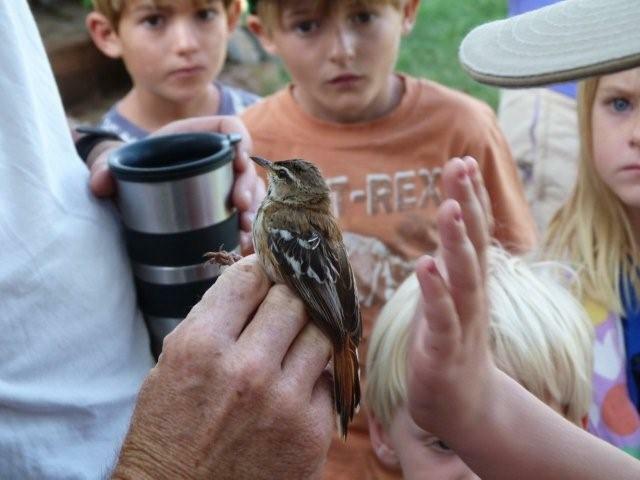 Admirng a White-browed Scrub Robin! This morning I took my children with me to go out and do some bird ringing (banding, if you're from the US or Australia!) with some friends just out of town. As is often the case when I'm ringing, I get asked lots of questions about why we ring birds, today's best was why we keep catching immature birds? There are lots of answers to this question and some of them focus on the fact that young birds are just less careful and are generally more stupid than their parents - but this bias aside it is a really good question and had me thinking again about the differences between bird lifestyles here in Africa, and those in higher latitude areas like Europe and North America. It just happened that the question came up after we'd caught two migrant birds (from Europe) and a very new baby White-browed Scrub Robin - all birds hatched within the last year. What I said at the time (and now I can look back over all the birds we caught this morning it's even clearer) was that whilst we often catch more immature than adult migrants, that's not true for the resident African birds we were catching. In fact, we only caught about 25 birds this morning, and only three of them were migrants (we were hoping for more, but this year has been surprisingly poor so far down here, the talk of all the local birds at the moment, as conditions seem good to us! 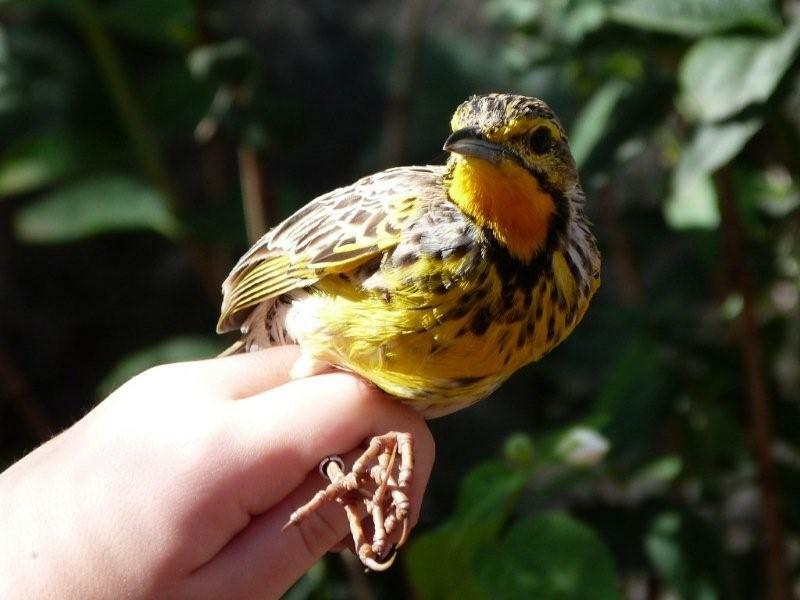 ), but all the migrants were young, whilst of the remaining resident African birds, only three were immature. This sample alone, of course, is of limited use: as a scientist I'd want much larger sample sizes - and I'd also want to know it wasn't just a seasonal thing - many of our local birds are only just begining to breed, so there simply aren't many babies around yet. 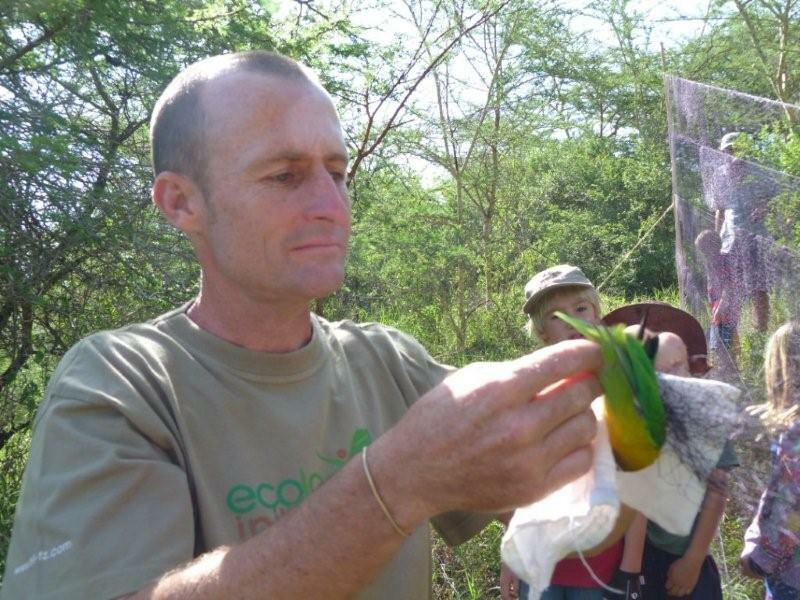 But put our results together with many others, and start to look at the data gathered in more detail and it is indeed clear that African birds do things rather differently to their higher latitude counterparts - as described in a nice paper by Wiersma et al "Tropical birds have a slow pace of life" (get it free here!). Not unlike a lot of people living here either! Lovebirds can live up to 20 years - they can also bite hard, so be careful extracting! 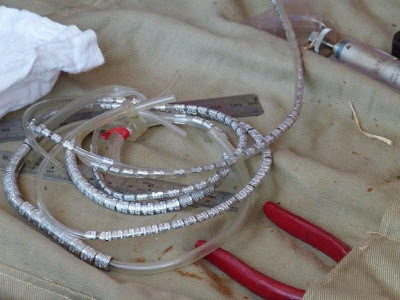 Each ring is uniquely numbered and has an address in Nairobi. We know from lots and lots of studies that survival of rates of birds in the tropics are generally higher than those of their counterparts in higher latitude areas (though there are also plenty of exceptions). 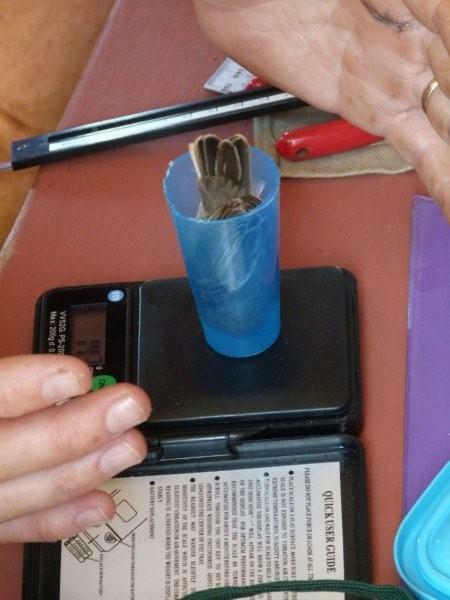 We also know that clutch sizes (the numbers of eggs) are also usually lower in the tropics than elsewhere. And incubation periods (how long the birds sit on eggs) are also generally longer. This whole cluster of behaviours - long lives, slow reproduction, long parental involvement, etc. - we call a life-history, and all point towards birds in the tropics doing things sloooowwwwwly. But why? These observations go back rather a long time and have their roots in the observations of Moreau here in Tanzania way back in the 1940s, and ever since then people have been trying to explain it. As you might imagine, we've come up with some pretty interesting ideas in that time, from the fairly widely discussed idea that it all stems in the very high predation rates on bird's nests here in the tropics (all those snakes, plus masses of mammals). This argument runs that high predation rates mean you'd be better off planing to have several nesting attempts and not having too many eggs in each attempt or you might run out of energy to try again. But then if you do have a successful nest, you've only got a few young from it so (a) you'd better look after them well because you'll be unlikely to raise more again soon, and (b) you'll not suffer the costs of raising so many children, so you'l live longer (yes, it's true!). Less widely accepted theories involve the idea that local birds in the tropics have smaller clutches because of competition from migrant birds from the north, who arrive just as they're tring to breed. This idea doesn't seem to explain all the different aspects of the tropics bird's slow lives, mind (why should they also have longer incubation times? Or live longer in general?). Or even that it's driven by the comparative lack of seasonality in the tropics (though this was written by a bunch of folk who I doubt have ever actually visited a savanna in the dry season, and I have extreme difficulty thinking it's really valid!). But the paper by Wiersma has some interesting additional observations that might just help explain things - they suggest that tropical birds do things slowly, because their whole metabolism is slower. 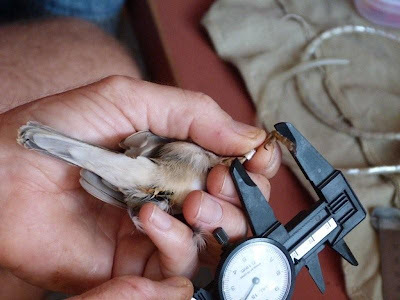 (What's more, they actually show this is true by direct measurement of metabolic rates in lots of birds). A slow metabolism could directly explain many of the observations we see - if they can escape being eaten they'll inevitable live longer, if they might going to live longer they should take fewer risks, so invest less in each nesting attempt and not attend the nest as often (which will result in the increased predation risk we see, and at the same time the longer incubation periods (though attentiveness doesn't explain all the difference, the lower metabilic rate of the chicks themselves could make up the difference)). Now that sounds rather neat, but the question remains - why should tropical birds have a lower metabilic rate. And this is where I think the ideas that Wiersma et al have are so neat, since they also showed that tropical birds can't increase their metabilic rate as much when placed in cold environments as birds from temperate climes. Which means, of course, that they can't generate as much heat to keep themselves warm in the cold - which is perfectly sensible, since they live in the tropics where cold is unusual. So the authors suggest that if you want to be able to keep warm - as you have to if you live in high latitude areas - you have to have a higher metabolic rate than your relatives who live in the tropics. And if you do that, you'll live shorter lives and must do things faster. Male Yellow Bishop are rather fine just now! Now I think this is a really neat theory - there's still lots of experiments we can do to test all the parts of it. But I also like it that a lot of these questions can only ever be answered if we have a good idea of how long birds actually live - and that means we need to keep doing regular ringing programmes and keep re-catching those birds uniquely marked throughout their lives - particularly here in the tropics where we really know so little. This was a very interesting entry and I enjoyed reading! Over here in Colorado I have seen many banded geese and ducks before but never any passerines. 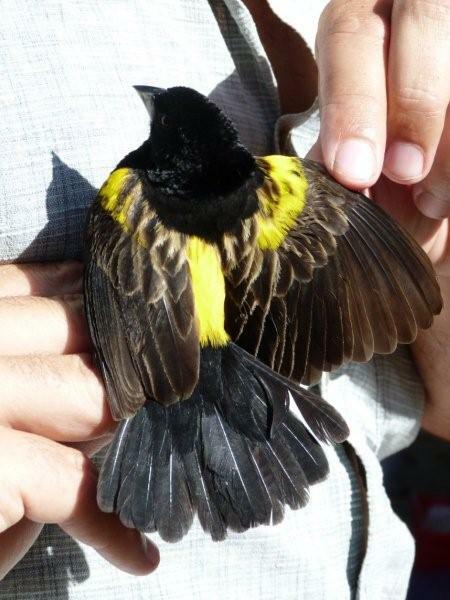 I think it is a cool way to find out the different migratory paths birds take. The scientists here, also use radio collars to track birds movements. Once my teacher brought in a great horned owls band and foot! He had found it in the Grand Canyon and I believe it had been tagged over 300 miles away showing how far birds travel! Great! There's so much we can only learn from ringing - is there anyone doing it near you where you can go and see what happens? It's great fun as well as useful! You might also like some of the satellite tagging websites - check out http://www.bto.org/science/migration/tracking-studies/cuckoo-tracking for one place with regular updates! Sadly I am unaware of anyone tagging birds on our area I mostly know about it from reading in book and from other peoples experiences. So I have unfortunately never actually seen it being done or talk to anyone who has actually done it themselves. :( Thanks for the website I will defiantly check it out! 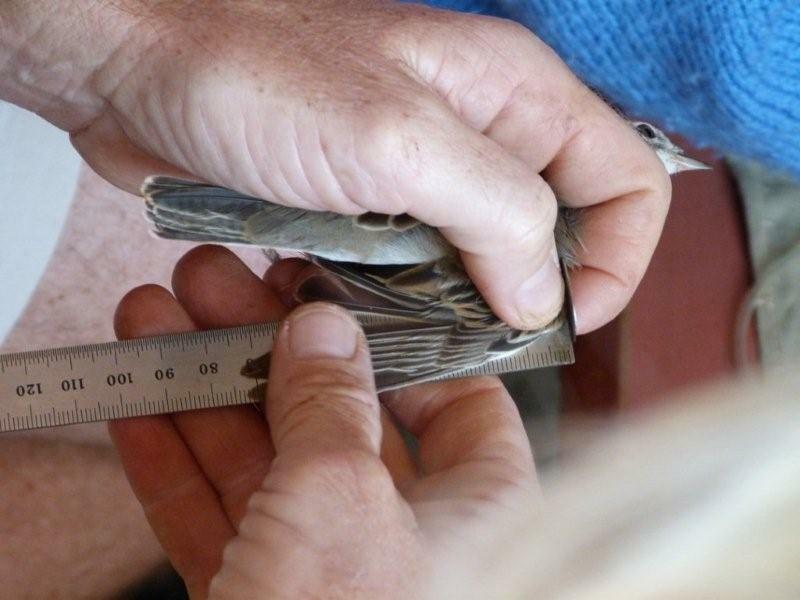 Try a google search for "bird banding colorado" and you might find somewhere near enough?